I recently found out that a friend whom I haven't seen in well over a year is a fan of my blog. I found this out because I was talking with her husband, and he said that she loves to read my blog. Then he said something that I'm still contemplating several days later. He said that his wife is really impressed by me . . . because I have three small kids AND I still manage to brush my hair. I don't know how she can be so certain that I brush my hair, since she never sees me, but she's right: I do, usually at least once a day. I know, it's amazing, isn't it? When I started blogging on October 23, 2005, my goal was two-fold: (1) to give myself the chance to write something that might be read by more people than myself and my husband (he's super supportive of my writing efforts, but I wanted a larger audience) and (2) to give my friends and family in the States a more intimate look into my life (since missionary prayer letters don't always provide the details that loved ones crave). That was almost six years ago. (Wow!) I've seen a lot of changes since then. I've gone from being an American abroad, paralyzed and frustrated by the language and culture, to someone with a deep appreciation for my adopted country who has learned to drive by the rules of the road here. I’ve gone from childless housewife with a part-time job and several ministries in the church to full-time stay-at-home mom with three small boys! And I've gone from occasional writer to committed blogger. Over the years, my blogging frequency has been erratic. I'd didn't write at all in 2007 (the year that began with the birth of our first child), and 2010 saw another hiatus (perhaps because that year began with morning sickness and ended with a 3-month-old infant in my arms). But this past spring, I made the decision to begin writing again, with the goal of adding a new post here once a week. It's been a rewarding half year, and connecting with you, my readers, has definitely been the main reward! So I wanted to let you know that some changes are coming to this blog. Now that I've sort of got the hang of writing regularly, I want to become more intentional about blogging. I'll be moving my blog to a different hosting domain, and you'll be seeing a new name, new look, and new format. To pursue my blogging dreams, I've been reading a variety of resources. 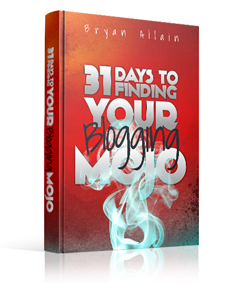 I just finished reading Bryan Allain's hilarious eBook 31 Days to Finding Your Blogging Mojo. It was so funny that I was having trouble getting through it, because every few paragraphs I had to stop to fend off my two older kids, who kept running over to find out what I was laughing about! But beyond Bryan's off-the-wall sense of humor, what I loved about this book was its imminent do-ability. The chapter-a-day format breaks it up into manageable portions, and each day's reading ends with an assignment that is both practical and feasible. By the time I complete all 31 assignments, I know that I'll be well on my way to meeting my blogging goals. I can hardly wait till the kids are tucked in for the night and I can grab a pen and do the first day's assignment! If you're a blogger, check out Brian's book on Amazon Kindle or as a PDF, and then come back here to let me know what you thought about it! I am a full-time, stay-at-home mom. I spend all day, almost every day, with small children. I gave birth to three babies, all of them boys, in under four years. (The most recent addition came just ten months ago.) The details of my day-to-day life revolve around the three little ones who need so much of my help and crave so much of my attention. In the middle of this stage, it's difficult to imagine that it could ever be any different. My life feels like an endless cycle of wiping runny noses, doing laundry, intervening in brotherly quarrels, preparing meals, helping children eat (while nursing the baby), vacuuming up little bits of food scattered all over the dining room floor, cleaning messy faces, tripping over toys, wiping poopy bottoms, folding piles of laundry, brushing little teeth, washing dishes, bathing little bodies, and collapsing into bed at the end of the day, praying for a night of uninterrupted sleep and hoping that the next day's cycle won't start before 7 a.m. I keep telling myself that it's just a stage. Little by little, the children will learn to do things for themselves. The constant fatigue will pass. I will not always feel perpetually distracted. The mental fog will lift (I hope). And one day my husband and I may be able to enjoy being spontaneous lovers again. I know these things, but it's difficult to imagine a life like that. But just the other day I realized that in one short year, we'll be getting ready to send our eldest to kindergarten, and I noticed that day by day he's becoming more of a little boy and less of a small child. Then I looked at my other two precious ones and was newly motivated to savor all the moments of their childhood, from kissing their boo-boos (real and imaginary), to cuddling them close (when they wake me up in the middle of the night), and watching their wonder and excitement as they discover the world around them (while making a horrific mess in the process). It's just a short stage, and when it's over, I know I'll miss it. Summer has arrived in Ukraine. For the last two weeks we've been enjoying sunny weather with temperatures in the high 70s and low 80s (that's the mid to high 20s, for all you Celsius readers out there). Even after living here for eight years, I am still amazed by the change from the dead of winter to the blaze of summer. In January it seems impossible that the earth could ever become warm again, but each June and July I find myself sweating and longing for the cool of autumn. I guess many things in life are like that. Night gives way to day. Tears end, and joy returns. No difficulty is permanent. 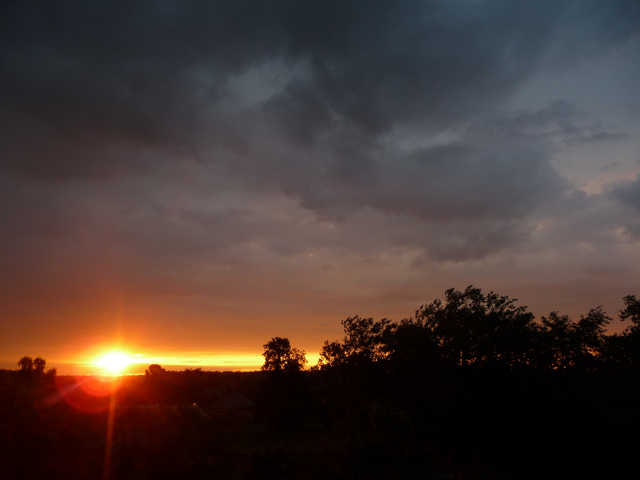 As it says in the Psalms, "Weeping may endure for a night, but joy comes in the morning." Now that summer is upon us, I've been reflecting on this past spring. I would love to hear what things you found interesting during that season. If you're a blogger, leave a comment with a link to your favorite post that you wrote during March, April, or May. (If you're not a blogger, you can link to your favorite post on someone else's blog.) I'm looking forward to reading your favorites! Here's mine. For as long as I've been old enough to contemplate it seriously, good parenting has seemed a mystery to me. How do you impart all the life lessons, the wisdom, the values, and the myriad other things that your kids need to know? I suspect it has much more to do with consistently being the type of person you would like your kids to become than with anything else. However, I'm sure that deep conversation and occasional confrontations are called for as well. But I'm discovering something that I never expected: parenting is something that you grow into. When I was pregnant with my son, I would sometimes wonder if we were ready for this awesome responsibility, but as the last fourteen months since his birth have gone by, I've realized that the demands of good parenting come in stages, so that one can master the simpler skills before more difficult things are required. When you first bring that newborn home from the hospital, your life revolves around it–feeding it, burping it, changing it, bathing it, feeding it . . . you get the picture. There will never be a time when this child is more dependent on you to meet all of his physical needs. But though the demands are constant, they are straightforward. Babies need lots of love and cuddling, but the maternal instinct makes meeting this need a no-brainer, and not much wisdom or creativity is required to figure out how to put the diaper on, what temperature to make the bath water, when the baby wants to eat, versus when he just wants to sleep, etc. The basic skills needed to care for an infant can easily be learned in under a week, and after that, it's just a matter of following the routine. But babies develop quickly, and soon after you've mastered the baby-care routine, you find that your little one starts to be able to grab some things, then roll over, then crawl, climb, and eventually walk. Each of these developmental milestones requires extra vigilance on your part, but the amount of wisdom needed to keep your baby safe is just at the level of common sense. However, as they develop physically, babies also develop mentally, and at some point the wise parent needs to begin to train the child. I've been involved in this training process since Samuel was about four or five months old. 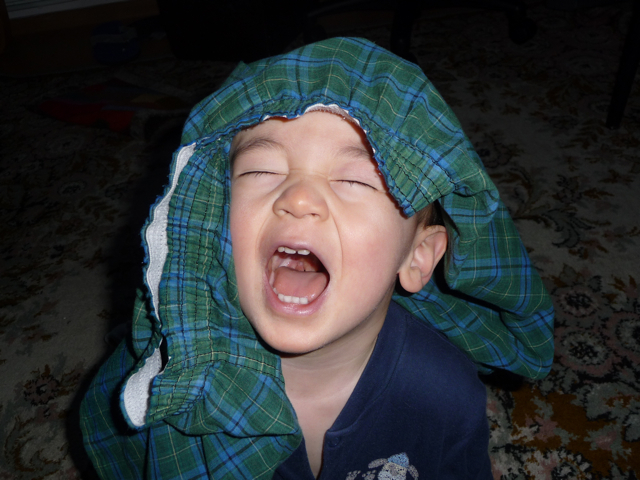 At first it was simply a matter of setting boundaries ("Let go of Mommy's hair") and enforcing them until he understood and obeyed. But as his mind has developed, so has his will, and now he's starting to challenge more frequently the boundaries that I've set. I recently realized that I'm starting to need to draw on the wisdom of other parents whose examples I had stored away for future reference. And so the difficult, crucial aspect of parenting deepens, that of helping to form the character of the little life that has been entrusted to your care. But, as I observed at the beginning of this post, it comes in stages. Each new challenge leaves new wisdom in its wake, which in turn, is available to help you meet the next challenge. It's like a series of stepping stones that gradually ascend to a distant peak. Seen from the plain, the heights look unattainable, but taken one step at a time, the journey, though difficult in places, is not only possible, but infinitely rewarding. "I'll be home for Christmas, if only in my dreams." What a nostalgic phrasing of the Christmas spirit. But what if one's situation makes it more accurate to say, "I'll be home this year, but Christmas is only in my dreams"? That's how I feel right now. Although Ukraine has a long Christian heritage, seventy years under an atheistic dictatorship destroyed much of what once was. I'm told that Ukrainians have rich traditions for the celebration of Christmas, and while I'm sure that's true, I have to say that all I've seen of Christmas in nearly three years of living here is commercial. All of Kyiv's shopping centers put up Christmas decorations and begin to sell Christmas cards and wrapping paper early in December, but sadly, most of the city's inhabitants see all of this pageantry as preparation for the New Year, not as a celebration of Christ's birth. Christmas has always been my favorite time of year. When I try to define what it is about Christmas that touches me so deeply, all I can say is "atmosphere." Even though the majority of Westerners have also lost sight of the true meaning of Christmas, enough of the message of, "Peace on earth, good will toward men," has remained to make it a special time for believers and non-believers alike. We've all noticed how people tend to smile more easily and be more considerate in the weeks preceding Christmas (unless, of course, they're trying to find a parking space at the mall). The spirit of giving our best to bring joy to those we love–just as God sent His Son to give salvation to the world He loved–is infectious, and it makes the whole Christmas season warmer and brighter than any other time of year. I miss this general spirit of good will. If I'm honest, I also miss many other things, but in my mind, they all combine to create the Christmas atmosphere that has always been so dear to me. I miss Christmas caroling, hot apple cider, people dressed in festive clothing, Christmas music everywhere you go, Christmas parties with friends, houses decorated with lights, the smell of Christmas baking, gift exchanges (white elephant and otherwise), the cozy ambiance of homes lit only by the glow of the Christmas tree, and–what goes along with each of these things–the laughter and special times shared with loved ones. I know that none of these signs of Christmas is directly related to the true reason for the season, and many Christians feel that they actually detract from it. But somehow, without them, I feel like I'm skipping Christmas. The birth of Jesus was such a momentous event that I feel it deserves all this celebration. Although most people may not remember Him in the midst of the festivities, I always have, making the signs of the season that much more precious to me. A friend of mine in the States recently told me that she is planning a Christmas party and expressed regret that I wouldn't be able to come. The sudden force of my desire to be there surprised me. I couldn't explain it away by the fact that I miss her and my other loved ones in the States. After all, I just saw them six months ago. I also knew that my response was not because I wanted to "be home for Christmas." I've lived in so many different places that if someone were to ask me where I considered to be home, I wouldn't know how to answer them. No, what I was missing and wanting so desperately was this Christmas atmosphere that I've been describing. My husband and I decided to move our life to Ukraine, so by choice, this is home. Neither of us wants to be anywhere else for Christmas. But at the same time, I feel that Christmas doesn't really come to Kyiv. So what am I to do? I will work to make our home a place filled with enough Christmas atmosphere to give us all we need for the whole season. And since people are so central to the celebration of Christmas, I will fill our home with family and friends during this time. Maybe I'll even throw a Christmas party for our closest friends–who are all Ukrainians–and, despite the seeming cultural inappropriateness, work in many of the traditions that are so dear to me. 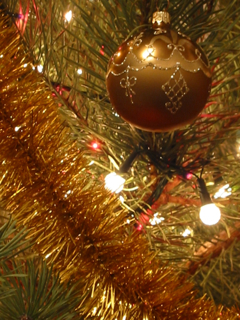 This year, I'll be home for Christmas–much more than I ever dreamed!